Has any one moved the post on the Shorland'r trailer? I can not find it now, but I think @Neutron mentioned moving the post on his trailer to balance the load. Is there a consensus on how much can the post be moved? I moved the boat easy took the tools with me to the ramp. Losened the strap to the length I guestimated was needed then backed down the ramp with a slight jerk at once it started to float. Pulled to the parking area and losened bolts and slid bow assembly back. Yup.... an added benifit it will come off trailer easier because it's further rearward. On a boat of this size there shouldn't be so much excessive tongue weight. You beat me to it. Thanks i was trying to figure out how to quote in this post from that post. I'm definitely doing this, just don't to push too far, if that is even possible. @Neutron - did you just do it in one step, or did you experiment with any interim shift distances? If anyone can confirm doing this and good towing experience with @Neutron's 8" post shift/mod, I'll just do the same. I noticed from years of working on jetskis that the trailer setup was almost always wrong. Couldn't even pick up a single ski from the ground without help. And most didnt have tongue jacks. We would use a automotive lift and raise the ski off then reset the bunks correctly and the bow crank position. Every customer couldn't believe the difference. In towing, moving around, and launching. I set mine after one move with a guess. Mine was applying the brakes too easy before now it is correct in every way. The trailer is very stable up to 65mph now. Where it wasnt before. @Neutron Thank you - I feel like this mod is the missing link for comfortable towing! I've been a bit obsessed with leveling the trailer/hitch ball and so on - so that's not an issue, but I could tell something is not completely right about those trailering combos, just couldn't put my finger on it. I did notice the boat sits rather far up on the trailer - towards the bow, and I do have a habit of pushing it in all the way (using the 5mph breaking trick), I just assumed that's what the doctor's ordered... But when you brought this up in @robert843's new AR thread - I immediately knew you were up to something important! I'm not following this. Did you move the entire pedestal (with the wench on top) backward on the trailer? A friend here bought a new Sea Hunt with trailer and his front two bunks were not even touching the bow. We ended up reversing the bunks, moved them towards the stern more and moved his boat back about 5 inches. Now the boat is supported correctly and is on the trailer correctly. I'm pretty sure my tongue weight is way over 500lbs...I wonder what the ideal weight should be? I am very intersted as my rear bunk is maybe inches from the bottom hull(aka too far forward) and whenever I ride, I get kind of a side to side shaking going on at highway speeds(rear end of the truck)... HOWEVER, this youtube video shows clearly in a controlled demonstration why weight distribution rearward is bad. this is how my boat sits on the trailer. Isn't anybody going to tell @blacksapphirez to tighten his straps? A little too much tongue weight is always better than too little (or negative/upwards) tongue weight. Things like towers, amount of fuel, add-ons and heavy loading in rear storage areas can shift weight around quite a bit from boat to boat. Full ballast bags and/or bilges full of water could really shift weight to the back making towing dangerous quick if someone forgets to drain bags or pull plugs. Yamaha and Shorelander have to set up the trailers conservatively for the worst conditions since it only takes 1 owner with no understanding of trailer loading dynamics to cause an issue. I'm sure most boats can probably be pushed back a little ways on the trailers, especially for those mindful of loads in the boat. Something to definitely keep in mind though. 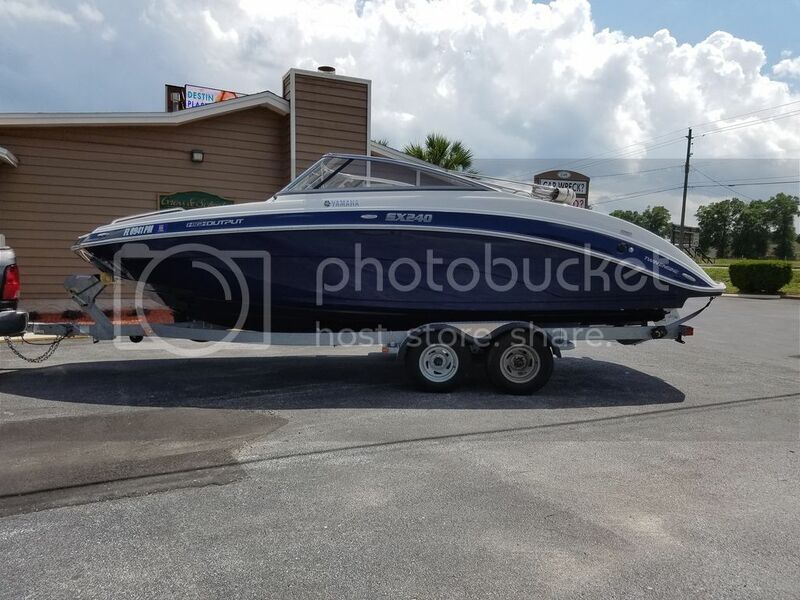 @swatski I just dropped my boat off at the boatel last weekend so now that the trailer is free I plan to move mine back about 6 inches in the next week or so I will let you know how it goes. Mine is so far forward I can't even open the tailgate of my suv with the boat back there. From everything I've learned and read about trailer weight, the tongue weight should be about 12% of total weight. I know my camper moves around much more when I don't have the front loaded like I normally do and the water tank is empty. I've never experienced instability from the tongue being too heavy, it's hard for me to imagine that the boat trailer is so heavy in the front it causes instability. The video posted above is a great example of weight distribution. A trailer with too little tongue weight is dangerous.